Chicken cutlet recipe is a one of those versatile, Indian chicken recipes, which can be served as an appetizer or snack at a party, along with some chutney and dips. You can even serve them as the main course with potatoes and steamed veggies on the side. I don't mind them in my main meal with a dal, raita, roti and salad on the side. Chicken cutlets taste so wonderfully good that everyone who likes chicken is bound to like them. Finley chop the carrots, celery and capsicum, in a food processor. Steam in a microwave for 2 minutes. Squeeze out as much water as possible, out of the vegetables. Keep aside. In the same food processor, chop the boneless chicken, chilies, ginger and garlic. Peel the boiled potatoes and add to the food processor, along with the squeezed vegetables. Give everything a quick mix and then tip over in a big bowl. Add the salt, pepper, coriander powder, finely chopped onion and fresh coriander. Mix well. Lightly beat an egg with a pinch of salt. In another bowl, add some bread crumbs. With clean hands, pick some chicken mixture and shape into round flat patty. Keep on a tray. When all are made, dip each one, in the egg and drop in the bread crumbs, roll in the crumbs, dust off excess and keep on another clean, dry tray. Use one hand for dipping and one hand for rolling in crumbs, otherwise your hands will become a mess and you will have to wash them frequently. Repeat with all the cutlets and then cover with a cling wrap and refrigerate for one hour. Heat oil in a kadai or any other deep cooking pot, fry one cutlet first on a medium heat. Take out when evenly brown. If browning too quickly, reduce the heat. 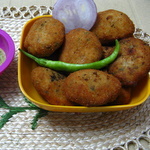 Similarly, fry a few cutlets at a time and drain on kitchen paper. Serve hot with some chili sauce or coriander chutney.